Clinton was expected to disclose plans to form a presidential exploratory committee on her Web site, according to Democratic officials familiar with the matter. With millions in the bank, a vast network of supporters and top status in nearly every poll of Democratic contenders, Clinton has launched the most viable effort by a female candidate to capture the White House. She is the first presidential spouse to pursue the office; her husband, Bill, served two terms in the White House from 1993-2001. After spending half his life in Congress, Connecticut's Senior Senator says enough is enough and bets everything on his presidential campaign. 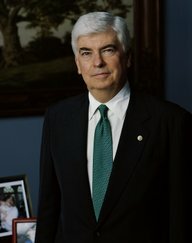 This allows Dodd's Senate campaign committee, Friends of Chris Dodd, to transfer excess funds to Dodd's presidential campaign committee, Chris Dodd for President Inc. His Senate campaign committee reported $1,855,961 cash-on-hand as of 9/30. Illinois Senator Barack Obama filed papers yesterday to form a presidential exploratory committee. Dodd decided not to "do that exploratory thing:"
Kathy Sullivan, the chairwoman of the Democratic Party in New Hampshire, said in an interview that she had spoken to Dodd and he said, "I'm not going to do the exploratory thing, I'm going to plunge right in." He has filed papers to run for the White House in 2008. Colorado Republican Congressman Tom Tancredo said Monday he will form a presidential exploratory committee this week. Tancredo has said he is "interested in a presidential run to highlight the immigration issue, and that he wants to challenge the views of candidates he finds objectionable." The Rocky Mountain News reminds us that "in the past, he [Tancredo] had admitted it would be 'delusional' to think he could win the White House but hinted that his running could keep pressure on other candidates not to abandon conservative principles." The five ians detained in Thursday's raid in Irbil are connected to 's Revolutionary Guard Corps's so-called Qods Force, or "Jerusalem Force" (IRGC-QF), an organization known for providing funds, weapons, improvised explosive device technology and training to extremist groups attempting to destabilize the Government of Iraq and attack Coalition forces. According to the coalition press release, the facility in which the Qods Force agents were captured was an ian liaison office, but it did not enjoy the diplomatic status of a consulate. 's interference in Iraq has been ongoing since the Baghdad fell. In November 2004, U.S. News published this article based, detailing 's role in destabilizing Iraq. The recent deployment of the 26th Marine Expeditionary Unit included about 120 leathernecks from the first Marine Special Operations Company. This is the first delpoyment of a Marine special operations unit. California Republican Congressman Duncan Hunter filed papers to form a Presidential Exploratory Committee on Friday. Hunter announced his intention to run last October. He filed papers to run for the White House in 2008 on Thursday. With Paul there are 25 26 prospective 2008 presidential candidates. I have followed the suggestion of several readers and included former U.S. Senator Mike Gravel. Gravel announced he was running in April. Texas Republican Congressman Ron Paul has filed papers to form a presidential exploratory committee. This will be Paul's second try for the White House; he was the Libertarian nominee for president in 1988. Paul was only one of six Republicans to vote against the war in Iraq. He was the only Republican congressman to vote against the 2007 Department of Defense appropriations bill. With Paul there are 25 26 prospective 2008 presidential candidates.